If you’re on a budget, brown bagging it is the way to go. Considering nearly a third of every U.S. dollar is spent on eating out, it certainly pays to cut that expense.1 The more meals you bring from home, the more money you’ll save – not to mention it can be a whole lot healthier if you make it yourself. Muster up the discipline and plan and prepare your meals for the week ahead on Sunday. Grill up some protein and divvy it out over some pre-made salads or make a big batch of chili or lentil soup for your weekday lunches. Alternatively, pack leftovers from dinner the night before. 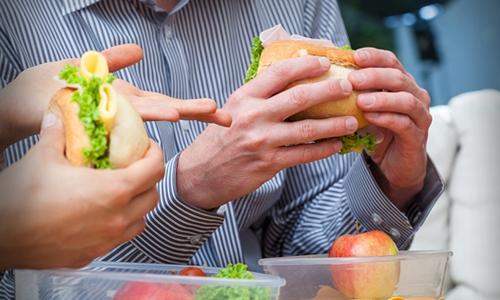 Do this as much as you can and the savings will add up – then you can afford to splurge on lunch with coworkers every now and then if you want. Saving money is all about finding the best deals no matter what you’re consuming. When it comes to buying lunch on a daily basis, finding the best deals in your area for your taste is key. Many lunching establishments offer deals of the day on certain days each week for a fixed price. Set a price for yourself – let’s say, $5 – and go find daily meal deals that fit the bill. A deli that offers a sub, bag of chips, and a drink on Mondays; a taqueria that offers $2 tacos on Tuesdays; a pizza joint that offers a slice and a salad on Wednesdays, etc. It’s really up to your taste. And you can find healthy options at fast food places, too! Check out websites and apps for coupons and additional savings in your area. This entry was posted on Wednesday, July 12th, 2017 at 2:30 pm	and is filed under Primerica. You can follow any responses to this entry through the RSS 2.0 feed. You can leave a response, or trackback from your own site.